Campaigners have scored a High Court victory against a council’s decision not to designate playing fields in west London as a local green space, after a judge ruled that the authority had carried out a ‘plainly inadequate’ and ‘manifestly unfair’ public consultation on the matter. A High Court ruling has been handed down in the case of Jopling v Richmond upon Thames London Borough Council, and Secretary of State for Housing Communities and Local Government. 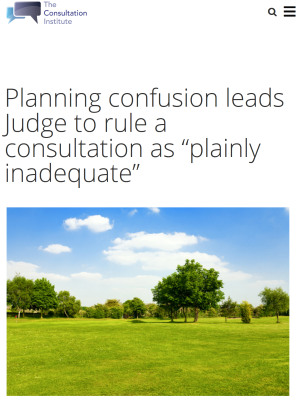 2.The consultation was plainly inadequate, principally because it was not clear what was actually to be consulted upon, for the reasons already given.